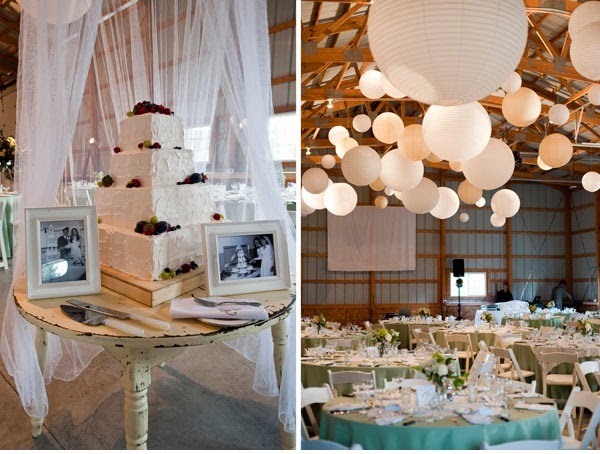 When you are having your wedding at a farm, barn, or a similar setting, a rustic design scheme can be just perfect. However, you want to be sure to combine that casual country feeling with the refinement and elegance that a wedding deserves. These are some tips on how to do rustic right. One of the main things to keep in mind when planning a rustic wedding is that it should still have touches of elegance and grace. You do not want it to end up being too rough around the edges, no matter how natural or raw the space may be. The key is to find a way to highlight the rustic charm that makes your wedding site special while adding a simple beauty to it. Keep in mind the comfort of your guests, as well. For instance, rough-hewn wooden beams would be striking in a barn ceiling, but dangerous to your guests as floorboards. 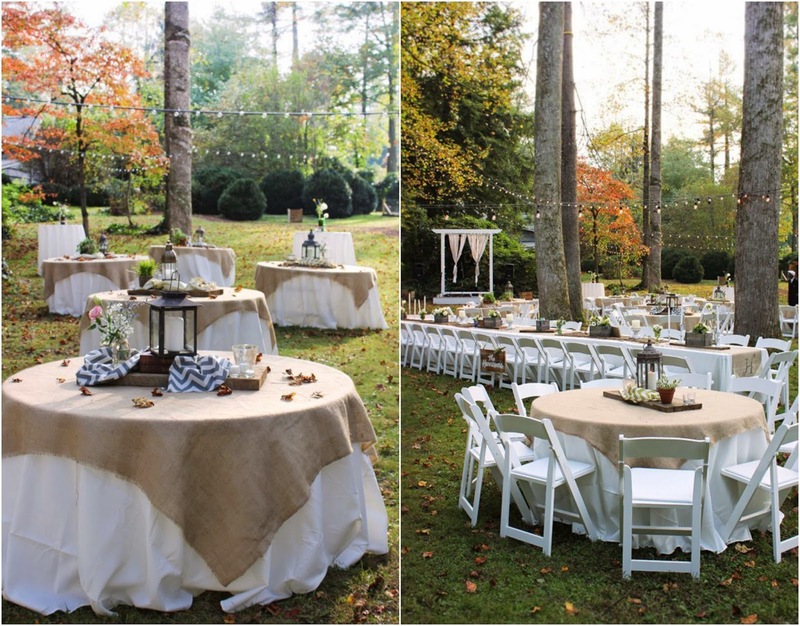 At autumn weddings, couples often like the look of hay bales for ceremony seating. They do have a great country appeal, yet the hay is also scratchy and prone to snagging your guests' clothing. A perfect compromise would be to use the haybales, but to drape a small blanket or piece of cloth across the top of each one. Plaid picnic blankets in fall colors would be ideal. If your reception is to be held inside an old barn, there are some terrific ways that you can make it feel festive and pretty while staying true to its rustic nature. 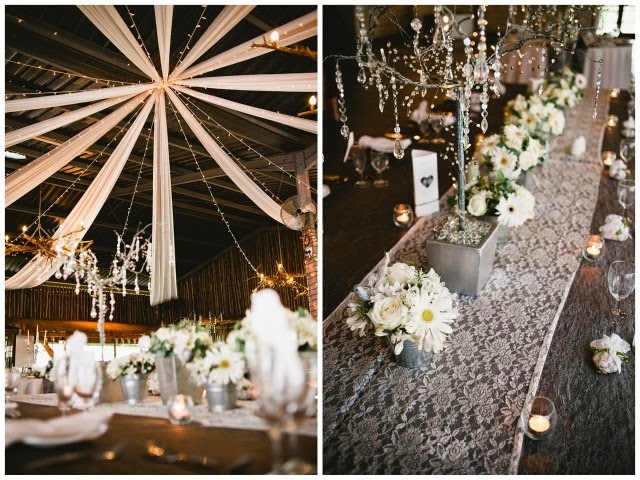 Strings of white lights can be strung through rafters and beams to cast a romantic glow over your reception. For your centerpieces, choose simple wildflower bouquets in white vases for a down-home country feeling, or get more elaborate, with impressive centerpieces that combine a wide range of natural materials such as flowers, branches, berries, leaves, and more. The bride and groom should give some thought to finding wedding attire that suits the rustic location. Again, there is a way to dress for a country setting that is still special enough for a wedding. In other words, you probably should not wear a tuxedo, but denim overalls are not the right look either. The happy medium can be found by selecting a bridal gown and wedding jewelry that have a handmade flavor to them. Fabrics like linen and silk shantung are dressy enough for a wedding, yet have a rough texture that makes them well- suited to a rustic site. Handmade wedding jewelry with unique features like coin pearls is the perfect accent for a casual bridal dress. With these tips in mind, it will be a snap to plan a lovely pastoral wedding. You can achieve that perfect blend of country charm and wedding elegance that will make your wedding warm and welcoming. 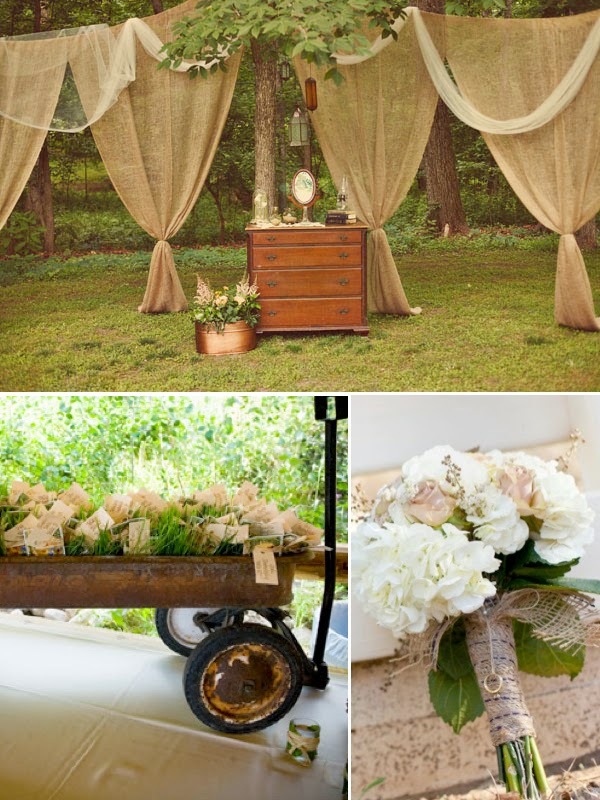 Your guests will be sure to enjoy your rustic wedding done right! I attended the wedding ceremony of my cousin at Philadelphia Wedding venues. I truly loved the place and preparations. My friend told me that they offered fine services at sensible price.